About ten years ago I did a very stupid thing that could easily have sunk our boat. Fortunately the weather was such that we remained afloat, but we did manage to fill the saloon with water to a depth of about 10 cm above the sole boards, plus the bilges below, which in our case are a maximum of about 15 cm. It is said that we learn from our mistakes, although I would have preferred not to have made one in the first place. However, some good did come out of it and we now have a bilge pump system that is fully capable of emptying the boat of water using manual power only, unlike the previous situation. We were wintering the boat afloat in a marina, where we carried out a number of modifications. One of these was to install warm air central heating, during which I was leading the trunking through a small locker in the aft cabin. The locker also contains the scupper tube that transfers water from on deck to a skin fitting at the waterline. In order to ease the problem of installing the trunking in such a small space, I disconnected and removed the scupper tube. And forgot to replace it when we left the boat on Sunday evening…..
Next Friday night we returned to the boat, to be met with sole boards, paint tins and various other bits and pieces, floating in the rainwater that had run into the saloon. 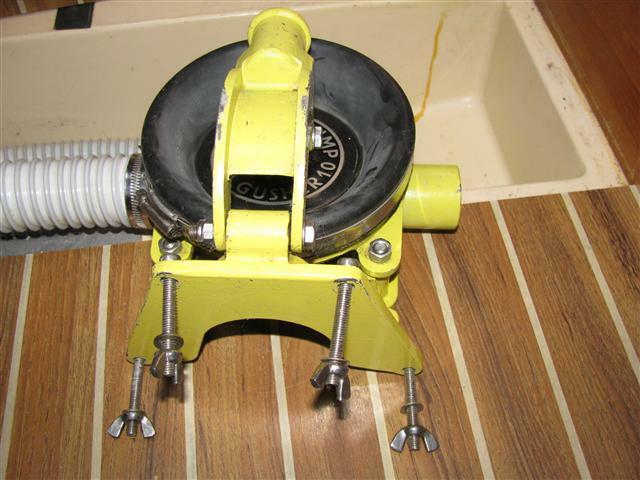 Our boat has a one-inch manual pump situated in the engine bilge, which is completely separate from the rest of the boat and useless for emptying the saloon. It also has an electric shower pump in a tray in the heads but this is a puny thing, more often clogged with hair than not. I also had a Whale Gusher 10 attached to a wooden board and some hose, which I fondly imagined would clear any ingress of water without hesitation. The first step was to remove as much debris as possible and deposit it in the cockpit. Next I started on the water with a bucket. We have all heard the old adage ‘the best bilge pump is a frightened man with a bucket’ hundreds of times since we started sailing. Maybe I wasn’t frightened enough. Lifting two gallons of water to shoulder height and tipping it into the cockpit is incredibly arduous work and it wasn’t long before my arm and shoulder muscles had had enough. I turned to my portable bilge pump, which soon proved to be near useless. The idea was to stand on one end of the board whilst pumping but to do this required me to be bent double, not a very ergonomic position. This was nearly as hard work as the bucket. Eventually, of course, we emptied and dried out but it could have been a very different story at sea and with a holed boat. The experience got us thinking about fitting a system that either of us could use, for sufficient time to move a lot of water while the other person attempted to stem a possible leak. How much are we talking about? The length of the saloon and heads on our modest 35-footer is 4.2 metres, its width 1.8 metres. This area filled to only 10 cm, or four inches, would be a volume of 756 litres. A Whale Gusher 10 has a flow rate of 85 litres/minute, so emptying this small amount would take almost 9 minutes. 84 two-gallon buckets would also suffice, assuming each one was filled to the brim. More water would increase the volume at a massive rate, as aft cabin, engine bilge, seat lockers and other areas began to flood. We were looking at a method of pumping for something like an hour, in the worst case. Batteries would soon be useless in this scenario, so the pump had to be manual. We devised a method that would allow us to work on our feet, using leg and back muscles that are far more capable of working for long periods. 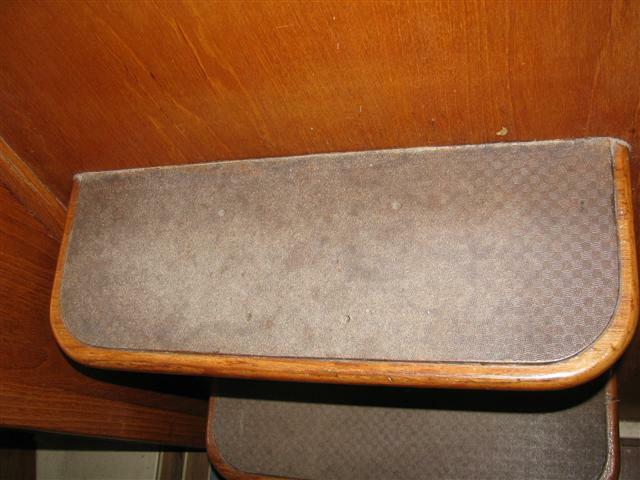 The best place for this was at the companionway steps, with the discharge hose passing over the bridge-deck to the cockpit. All that was needed was to drill four holes in the second step, matching the mounting holes in the pump, and then attaching the two with bolts and wing nuts. 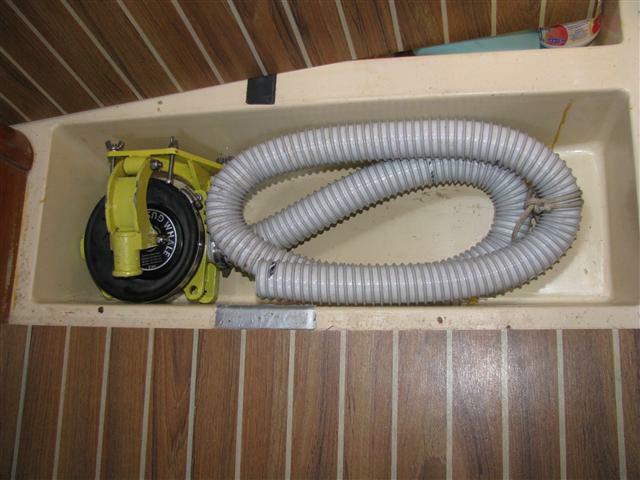 The suction pipe goes to the forward section of the bilge, where it is attached to a permanently fixed strum box on the bilge wall. 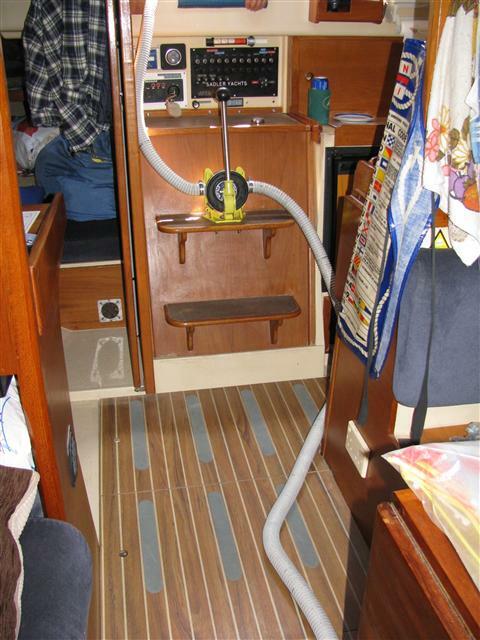 In normal service the suction hose is stowed in one bilge section, the pump and discharge hose being in another. It takes me four minutes to assemble the whole lot, from a standing start. The discharge hose empties into the cockpit, where it is retained by a plastic hook to one of our lifeline U-bolts. Practice using buckets of water soon showed that either of us could happily pump for 15-minute spells, when we mostly became bored with the process. We are now confident that, if the worst happened, we could continue to pump for an appreciable time, allowing a serious leak to be found and plugged. This photo shows everything ready for use. The top of the handle is at a height about middle of chest, where it is easy to pump for long periods by simply rocking fore and aft. Second step. Four 6 mm holes were the only visible modification made to the boat. As shown, they are almost unnoticeable.. 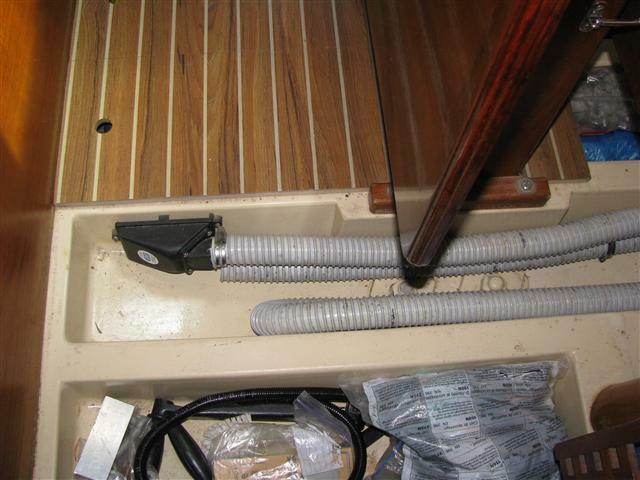 The pump and discharge hose fit neatly into the bilge for stowage. The short length of line and plastic hook retain the end in the cockpit. The pump base is wide, giving a firm mounting on the step. 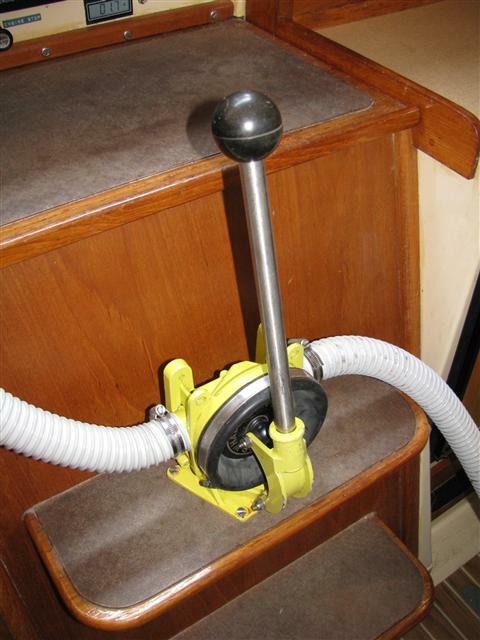 The strum box is permanently screwed to the bilge wall, where the suction hose is stowed. 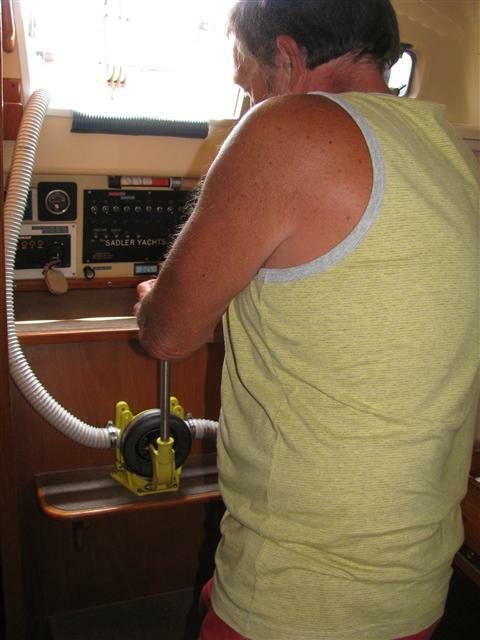 The pump mounted on the companionway step. A neat arrangement and the perfect height for prolonged operation. Either of us can use the pump without great exertion being necessary.